Try Dream Maker Pool and Spa products for high quality filtration goods. Filters Fast carries a wide variety of pool and spa filters to suit your water filtration and purification needs. Try Dream Maker Pool and Spa products for high quality filtration goods. 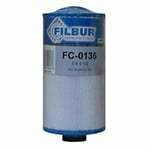 The Filbur FC-0136 Dream Maker Pool and Spa Filter replaces Pleatco PDM25P4 and is also known as 05-08102. Filbur Pool and Spa filters are made of Reemay spunbound polyester pleated filter media and feature anti-microbial technology.